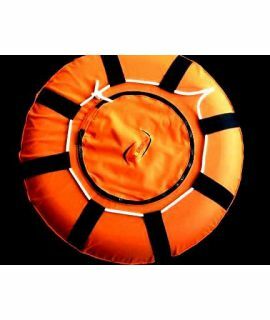 The closed version - developed exclusively by the A.P.Valves' design team - has what appears to be an open ended base but as soon as you fill the buoy the internal baffle is forced shut preventing the buoy from accidentally deflating on the surface. The SMBC also features a stream-lining flap which closes over the mouth when used in a current to prevent any sea-anchor effect. 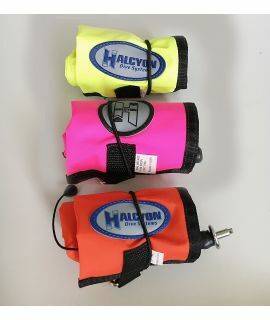 The AP5 over-pressure / dump valve prevents the buoy from bursting and allows deflation after use. 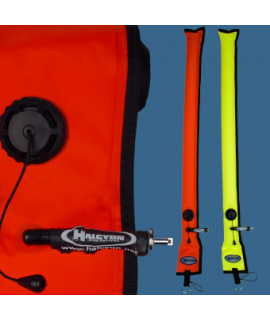 Simply attach a line or reel and you have a superb decompression marker buoy and also a buoy that can be used as a standard surface marker. Length: 140cm.